Goldfinch Bird Feeder Pole Station has a spiral thistle Goldfinch bird feeder, a thistle sock bird feeder and 2 yellow weather guards. The Bird Feeder Pole really shows these off and is 6 ft above ground. 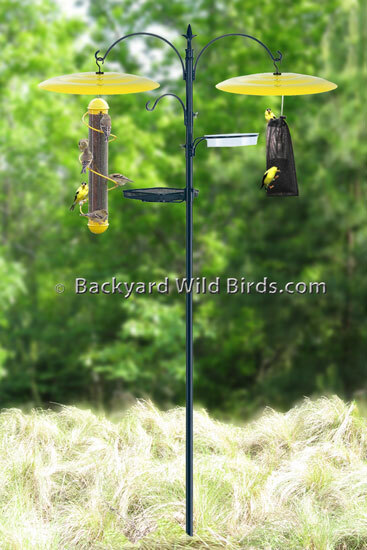 The Bird Feeder Pole system comes complete with two 15 inch yellow metal weather guards to keep the weather off of the thistle seed bird feeders. There are two Goldfinch bird feeders. The 17.5" spiral thistle Goldfinch feeder is an easy to clean removable top and base style feeder. It has thistle seed feeding ports all over the tube that the spiral arm that goes around the feeder gives access to. The birds really love to run the spiral. The thistle sock is 12 inch long sock just for thistle seeds that the Goldfinches can cling all over it. The Pole includes: Decorative top with fleur-de-lys finial. Double 10" reach hanger arms. The extra small 5" single feeder hook, Bird bath support ring with bird bath and Mesh feeder tray, which have thumb screws to adjust their positions on the pole. The three section 3/4" diameter pole builds for overall full height of 7 ft 5 in (6 ft above ground). No need to worry about squirrels because they don't like thistle seed. Makes a very attractive bright bird feeder pole system and display in your backyard.